This article is about the stage musical. For the source book, see Gypsy: A Memoir. For the film, see Gypsy (1962 film). The musical contains many songs that became popular standards, including "Everything's Coming up Roses", "Together (Wherever We Go)", "Small World", "You Gotta Get a Gimmick", "Let Me Entertain You", "All I Need Is the Girl", and "Rose's Turn". It is frequently considered one of the crowning achievements of the mid-20th century's conventional musical theatre art form, often called the "book musical". Gypsy has been referred to as the greatest American musical by numerous critics and writers, among them Ben Brantley ("what may be the greatest of all American musicals...") and Frank Rich. Rich wrote that "Gypsy is nothing if not Broadway's own brassy, unlikely answer to King Lear." Theater critic Clive Barnes wrote that "Gypsy is one of the best of musicals..." and described Rose as "one of the few truly complex characters in the American musical." A musical based on the memoirs of Gypsy Rose Lee was a project of producer David Merrick and actress Ethel Merman. Merrick had read a chapter of Lee's memoirs in Harper's Magazine and approached Lee to obtain the rights. Jerome Robbins was interested, and wanted Leland Hayward as co-producer; Merman also wanted Hayward to produce her next show. Merrick and Hayward approached Arthur Laurents to write the book. As he relates, Laurents initially was not interested until he saw that the story was one of parents living their children's lives. Composers Irving Berlin and Cole Porter declined the project. Finally, Robbins asked Stephen Sondheim, who agreed to do it. Sondheim had worked with Robbins and Laurents on the musical West Side Story. 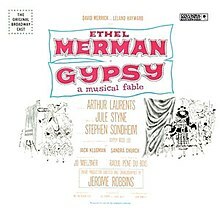 However, Merman did not want an unknown composer, and wanted Jule Styne to write the music. Although Sondheim initially refused to write only the lyrics, he was persuaded by Oscar Hammerstein to accept the job. Rose and her two daughters, Baby June and Louise, play the vaudeville circuit around the United States in the early 1920s. Rose, the archetype of a stage mother, is aggressive and domineering, pushing her children to perform. While June is an extroverted, talented child star, the older girl, Louise, is shy. The kiddie act has one song, "May We Entertain You", that they sing over and over again, with June always as the centerpiece and Louise often as one of the "boys" ("Baby June and Her Newsboys"). Rose has big dreams for the girls but encounters setbacks, such as attempting to borrow money from her father ("Some People"). When Rose meets a former agent, Herbie, she persuades him to become their manager using her seductive and feminine wiles ("Small World"). The girls grow up, and June, now billed as Dainty June, and her act have a chance to perform for Mr. Goldstone of the Orpheum Circuit ("Mr. Goldstone, I Love You"). Meanwhile, Louise celebrates her birthday alone and asks her birthday present, a lamb, just how old she is this year ("Little Lamb"). After Rose rejects Herbie's marriage proposal, he considers leaving, but she asserts that he could never get away from her ("You'll Never Get Away From Me"). Now billed as "Dainty June and Her Farmboys", the act finally performs on the Orpheum Circuit ("Dainty June and Her Farmboys"). June is soon offered a place at a Performing Arts school after an audition. However, Rose turns this down, refusing to break up the act. Louise and June fantasize what life would be like if Rose were married and finished with show business ("If Momma Was Married"). A few months later, still on the road from show to show, Tulsa, one of the boys from the act, confides in Louise that he has been working on his own act ("All I Need Is the Girl"), and Louise fantasizes that she and he could do the act together. Shortly after, June is missing, and in a note, she explains that she has grown sick of her mother and the endless tour and has eloped with Tulsa, and they will do a new act. Rose is hurt, but then optimistically vows that she will make Louise a star, proclaiming that "Everything's Coming up Roses". Louise is now a young woman, and Rose has built a pale imitation of the Dainty June act for her. Using all girls, Rose and Herbie try valiantly to sell "Madame Rose's Toreadorables" to a fading vaudeville industry. However, they are still together ("Together, Wherever We Go"). With no vaudeville venues left, Louise and her second-rate act wind up accidentally booked at a burlesque house in Wichita, Kansas, as a means to deter police raids. Rose is anguished, as she sees what a booking in burlesque means to her dreams of success, but Louise persuades her that two weeks' pay for the new act is better than unemployment. As they are introduced to Louise, three of the strippers on the bill advise her on what it takes to be a successful stripper, a "gimmick," something that "makes your strip special" ("You Gotta Get a Gimmick"). Backstage, Rose proposes marriage to Herbie. He asks her to break up the act and let Louise have a normal life, and she reluctantly accepts, agreeing to marry the day after their show closes. On the last day of the booking, the star stripper in the burlesque show is arrested for solicitation. Desperate, Rose cannot resist the urge to give Louise another nudge toward stardom, and she volunteers Louise to do the strip tease as a last-minute replacement. Disgusted at Rose's blind ambition for her daughter, Herbie walks out on Rose forever ("Small World (Reprise)"). Although reluctant, Louise wants to please her mother and she goes on, assured by Rose that she needn't actually strip, but simply walk elegantly and tease by dropping a single shoulder strap. Shy and hesitant, she sings a titillating version of the old kiddie act song, "May We Entertain You?". She removes only her glove, but she speaks directly to her 'audience', which becomes her "gimmick" ("Let Me Entertain You (Gypsy Strip Tease)"). In the months that follow Louise becomes secure, always following her mother's advice to "Make 'em beg for more, and then don't give it to them!" The song becomes brasher and brassier, and more and more articles of clothing come off. Ultimately, Louise becomes a major burlesque star and does not need her mother any longer. After a bitter argument between Rose and Louise, who has become the sophisticated "Gypsy Rose Lee," Rose realizes Herbie and June are both gone, and now Louise is lost to her as well. Rose, feeling sad, useless and bitter, asks "Why did I do it? What did it get me?" ("Rose's Turn"). All of Rose's unrequited dreams of her own stardom and her personal demons surface. She fantasizes about her own lit-up runway and cheering audience, but finally admits "I did it for me." After her admission to Louise, mother and daughter tentatively step toward reconciliation in the end. In the 1974 and 2008 Broadway revivals, although the final dialogue scene remains, there is not a happy ending, but rather a bleak, sad one as all hopes of reconciliation for Rose and Louise fall flat when Louise walks away, laughing sarcastically at Rose's new "dream." The audience is then left with a Rose whose dream of her own lit up marquee slowly fades away to her craziness within taking over. In the 2003 revival starring Bernadette Peters, the final dialogue scene remains, but leaves the ending open to more interpretation from the audience. Louise walks through the stage door, with Rose following behind. Rose then turns to face the audience, a look of sadness and longing on her face as she takes one last look at the empty stage. She pauses and slowly closes the door. In the 2015 West End revival starring Imelda Staunton, Louise begins to walk out, and Rose catches up after waking up to reality. Louise puts her arm around Rose as they exit together, giving off the appearance that Louise is taking care of Rose instead. ^ Per sondheimguide.com, only Tulsa sings this song; per IBDB, both Tulsa and Louise sing the song, due perhaps to the fact that, in several cast recordings, Louise's laughter can be heard at the end of the final dance break. ^ Titled "The Strip" in the 2008 revival and on the recording of the 1989 revival. During the pre-Broadway tryout tour, several songs were cut, including a song for Herbie called "Nice She Ain't" (cut because it was given to Jack Klugman one week prior to opening and he could not memorize the keys and staging in time), and a song for Baby June and Baby Louise titled "Mama's Talkin' Soft". The latter song was cut partly because the staging required the little girls to stand on a platform elevated above the stage, which terrified the young actress playing Baby Louise and partly because the show was running too long. "Mama's Talkin' Soft" was later recorded by Petula Clark and released as a single in the UK in 1959. Other cut songs include "Mother's Day", a song for Baby June's act, "Smile, Girls", which involves Rose trying to teach the untalented girls to smile in order to make the act look good, "Who Needs Him? ", which Rose sings to herself after Herbie leaves her, and "Three Wishes for Christmas", a burlesque number similar to one that would be performed at Minsky's Burlesque. In analyzing the character of Rose, Clive Barnes described her as "bossy, demanding, horrific". Rich described Rose as "a monster". Critic Walter Kerr commented that though Rose is a monster, she must be liked and understood. Patti LuPone describes Rose: "She has tunnel vision, she's driven, and she loves her kids.... And she is a survivor. I do not see her as a monster at all—she may do monstrous things, but that does not make a monster." Sondheim has said of the character: "The fact that she's monstrous to her daughters and the world is secondary... She's a very American character, a gallant figure and a life force." Sondheim also noted, "Yet the end of Gypsy is not entirely bleak. Louise comes out a star and forgives her mother. There is hope for her. Rose does confront who she is in 'Rose's Turn.' There is a catharsis. It's not Rodgers and Hammerstein, but you feel maybe the mother and daughter will come to an understanding and maybe triumph over Rose's craziness and Louise's bitterness." Brantley noted that Rose is a "mythic character". She is "[t]raditionally presented as an armored tank on autopilot, which finally crashes only minutes before the final curtain". Bernadette Peters' take on the character was different: "Rose was a woman who was traumatized by her own mother leaving her at an early age. I think that longing for acceptance is what fuels all her ambition. In the end, when she confronts herself in 'Rose's Turn', she realizes she has failed her daughter just as her own mother failed her...and that destroys Rose. There is a vulnerability to Rose that makes her human, not just some loud and cartoonish parody of a stage mother." The original Broadway production opened on May 21, 1959 at The Broadway Theatre, transferred to the Imperial Theatre, and closed on March 25, 1961 after 702 performances and two previews. The show was produced by David Merrick and directed and choreographed by Jerome Robbins. Ethel Merman starred as Rose, with Jack Klugman as Herbie and Sandra Church as Louise. Scenic and Lighting design were by Jo Mielziner and costumes were by Raoul Pène Du Bois. The orchestrations, including an overture, were supplied by Sid Ramin and Robert Ginzler. Critic Frank Rich has referred to Robbins' work as one of the most influential stagings of a musical in American theatrical history. The original production received eight Tony Award nominations, including Best Musical, Best Actress in a Musical, Best Featured Actor in a Musical, Best Featured Actress in a Musical, Best Scenic Design, Best Costume Design and Best Direction of a Musical, but failed to win any. When the show closed in March 1961, two national touring companies toured the US. The first company starred Merman and opened in March 1961 at the Rochester, New York Auditorium, and closed in December 1961 at the American, St. Louis, Missouri. The second national company starred Mitzi Green as Rose, followed by Mary McCarty. A young Bernadette Peters appeared in the ensemble and understudied Dainty June, a role she would play the following year in summer stock, opposite Betty Hutton's Rose. It opened in September 1961 at the Shubert Theatre, Detroit and closed in January 1962 at the Hanna, Cleveland, Ohio. In 1973, it was announced that Elaine Stritch would be starring in the first West End production of the show. However, when ticket sales proved to be unsuccessful, producers hired the more familiar Angela Lansbury (according to Craig Zadan, "The ...producers were not able to raise the required capital on Stritch's name, and the promise of a new production...became ominously distant"). The West End production opened at the Piccadilly Theatre on May 29, 1973. It was produced by Barry M. Brown and Fritz Holt, in association with Edgar Lansbury (Angela's brother) and directed by the show's author, Arthur Laurents, with choreography reproduced by Robert Tucker. The supporting cast featured Zan Charisse, Barrie Ingham, Debbie Bowen and Bonnie Langford. Lansbury left the London production in December 1973 to tour the show in the USA and was succeeded by Dolores Gray. The production closed on March 2, 1974, after 300 performances. Prior to opening on Broadway, the Lansbury West End production had a 24-week tour of North America, starting in Toronto, and then travelling to many cities, including Los Angeles, Philadelphia, Washington, DC and Boston. The production opened on Broadway at the Winter Garden Theatre on September 23, 1974 for a planned limited engagement, and closed on January 4, 1975 after 120 performances and four previews. The cast remained mainly the same on Broadway, except that Rex Robbins played Herbie, Maureen Moore (later Bernadette Peters' understudy as Rose in the 2003 revival) played the adult June, and Mary Louise Wilson was Tessie Tura. Angela Lansbury won the 1975 Tony Award. A second revival had pre-Broadway engagements starting at the Jackie Gleason Theater of the Performing Arts, Miami Beach, Florida, in May 1989, and Tampa in May, then The Muny, St. Louis, in June 1989, moving to the Los Angeles Music Center and Orange County Performing Arts Center, Costa Mesa, California in July 1989, and at the Kennedy Center in August and September 1989, with several other venues prior to Broadway. The production opened on Broadway on November 16, 1989, at the St. James Theatre, and then moved to the Marquis Theatre on April 18, 1991 and closed on July 28, 1991 after 476 performances and 23 previews. Laurents returned as director, with Tyne Daly as Rose, Jonathan Hadary as Herbie and Crista Moore as Louise. Linda Lavin (on July 30, 1990) and Jamie Ross replaced Daly and Hadary respectively, with Daly returning to the production at the Marquis Theatre from April 18, 1991 until closing. This production won the Drama Desk Award for Outstanding Revival and Daly won the Tony Award for Best Actress in a Musical for her performance. Jule Styne, in a 1989 interview in connection with the California tryout, said: "About six months ago, Bette Midler wanted to buy it (Gypsy) for a movie. We wouldn't sell it. Because they'd only destroy it." USA Today reported that "Both Liza Minnelli and Bernadette Peters say they would love to play it, but they weren't even approached for this production." A new Broadway revival began previews on March 31, 2003 and opened on May 1, 2003 at the Shubert Theatre. The director was Sam Mendes, with choreography by Jerry Mitchell and costumes and sets by Anthony Ward. Bernadette Peters played the role of Rose. The New York Times described Peters as "a surefire box office draw who nonetheless may surprise some Gypsy aficionados...How will the ladylike Ms. Peters fit into the role of Rose, a part indelibly marked by its brassy, belting originator, Ethel Merman?... 'One of the main reasons I wanted to do the piece was to cast someone as Rose that was closer to Rose as she really existed,' Mr. Mendes said. 'She was a tiny woman. And she was a charmer. And so is Bernadette.'" Laurents had talked to Mendes ("Roughly five years ago" according to The New York Times in 2003) about directing the revival, and Mendes said "he was surprised by the idea of casting Ms. Peters as Rose". Laurents notes of his suggestions on this production are in his 2009 book Mainly on Directing 'Gypsy', 'West Side Story' and Other Musicals. In a 2004 interview Laurents said that Peters' portrayal of Rose was "brilliant, original, totally unlike any of the others" while criticizing Mendes for the "physical production" which Laurents said "was misconceived and hurt the show more than people realized." Gypsy had begun previews with a virtually bare stage, but by opening night this had been changed to a minimalist set. The cast featured John Dossett as Herbie, Tammy Blanchard as Louise, Kate Reinders as June and David Burtka as Tulsa. The production was nominated for four Tony Awards, including Best Revival of a Musical and Best Actress in a Musical. In his review, Ben Brantley in The New York Times wrote that "the surprise coup of many a Broadway season...Working against type and expectation under the direction of Sam Mendes, Ms. Peters has created the most complex and compelling portrait of her long career...There have been many illustrious successors to Merman as Rose...Only Ms. Peters, however, can be said to have broken the Merman mold completely." Gypsy twice set new box office records for the Shubert Theatre. Its gross of $853,476 for the week of June 9–14, 2003 was the highest ever gross for a non-holiday week and the subsequent June 15–21, 2003 box office gross of $874,397 represented the highest gross for a show in Shubert history. However, The New York Times announced that Gypsy would close on February 28, 2004, stating: "Gypsy sold well for most of 2003. But by early January , with tourists gone and local theatergoers staying inside during a brutal stretch of weather, the production's sales grew increasingly weak. More important, the show's advance sale, the main indicator of a production's staying power, began to shrink rapidly. It stood at less than $2 million yesterday." After an increase in the gross, the show's closing was postponed indefinitely, but Gypsy finally closed on May 30, 2004 after 451 performances and 33 previews. The production is believed to have recouped a little more than half of its $8 million investment. LuPone recounted in her memoirs that, when Laurents began directing this production, he based his direction initially on the 1989 revival, "because, I think that in Arthur's mind, the Tyne Daly Gypsy had been the last successful production." However, the cast "questioned Arthur relentlessly about...the scenes", and he "tossed the old prompt book out and freed" the actors to explore. "You see, everyone's starved for attention in Gypsy. That craving, after all, is the motor that keeps showbiz puttering along. And Mr. Laurents makes sure that we sense that hunger in everyone.... I was so caught up in the emotional wrestling matches between the characters (and within themselves), that I didn't really think about the songs as songs.... There is no separation at all between song and character, which is what happens in those uncommon moments when musicals reach upward to achieve their ideal reasons to be." This production won numerous awards including the Tony Awards and Drama Desk Awards for LuPone, Gaines and Benanti. The show was originally scheduled to close in March 2009 on LuPone's final performance, but closed on January 11, 2009 due to decreases in ticket sales. Like the 2003 production, this revival also closed at a loss. The production played for 332 performances and 27 previews. On the eve before the final curtain call, LuPone made news when she literally stopped the show in the middle of the song "Rose's Turn", to scold a patron for taking illegal photographs during the performance. Patti LuPone had performed in Gypsy prior to Broadway. She has stated that when she was thirteen years old, she starred as Louise in a high-school production of the show. LuPone had voiced interest in heading the 2003 Broadway revival but author Arthur Laurents had reportedly banned her from any future work with his involvement, as she had previously walked out on a production of Jolson Sings Again, written by Laurents, in 1995. LuPone and Laurents subsequently reconciled. Following a run at the Chichester Festival Theatre, which won the Critics' Choice Theatre Award for Best Musical in 2014, a West End revival of Gypsy opened at the Savoy Theatre on April 15, 2015, in a limited run through November 28. Directed by Jonathan Kent with choreography by Stephen Mear and set and costume design by Anthony Ward, the production starred Imelda Staunton as Rose, Peter Davison as Herbie, Lara Pulver as Louise, Gemma Sutton as June, Dan Burton as Tulsa, Anita Louise Combe as Tessie Tura, Louise Gold as Mazzeppa and Julie Legrand as Electra. The London production was nominated for eight Laurence Olivier Awards at the 2016 ceremony, winning four, including Best Actress in a Musical (Staunton) and Best Musical Revival, the most awards won by a single production in that year. It also won Best Musical Production and Best Performance in a Musical (for Staunton) at the UK Theatre Awards in 2015. Staunton also won Best Musical Performance at the Evening Standard Awards in 2015. The production was also filmed and broadcast on BBC Four over the 2015 Christmas/New Year period and was first broadcast on PBS' Great Performances in the United States in 2016. The production opened at the Teatro Astral in Buenos Aires, directed by Víctor García Peralta. Mabel Manzotti starred. The cast included Sandra Guida (as Gypsy), along with Eleonora Wexler and Ambar La Fox. The production opened at the Teatro Silvia Pinal in Mexico City, produced and directed by Silvia Pinal (legendary Luis Buñuel's Viridiana muse). Pinal and her daughter, the rock singer Alejandra Guzmán starred. Guzmán was replaced by Irán Castillo. Betty Buckley, Deborah Gibson and Lenny Wolpe starred at the Paper Mill Playhouse in Millburn, New Jersey. Laura Bell Bundy played June. It was rumored to be Broadway bound, but this did not materialize. The production opened at the Theatre Vanemuine in Tartu, directed by Mare Tommingas. The cast included Silvi Vrait as Mama Rose and the production would enjoy a successful run of performances from 2001 through 2003. This production ran in rep at the Shaw Festival, Niagara-on-the-Lake, Ontario starring Nora McLellan as Rose and Julie Martell as Louise. Martell understudied Tammy Blanchard in the 2003 Broadway revival. Also, Kate Hennig, who has appeared on Broadway as Ms. Wilkinson in Billy Elliot, played Ms. Cratchitt as well as understudying and playing Rose at certain scheduled performances. Gypsy was presented by Phoenix Entertainment with Kathy Halenda starring as Rose and Missy Dowse as Louise. The production was directed by Sam Viverto and assisted by Aja Kane. Principal casting also included Ruby Lewis as June, Rachel Abrams as Mazeppa, Claire Norden as Baby June, Loriann Freda as Tessie Tura, Nick Hamel as Herbie, and Maria Egler as Electra. The tour ended in May 2008. The first Brazilian production opened at Teatro Villa-Lobos, Rio de Janeiro, starring Totia Meirelles as Rose, Renata Ricci as June, and Eduardo Falcão as Herbie. Later the production was transferred to Teatro Alfa, São Paulo. The very first production of the musical Gypsy in Joseph Kajetan Tyl's Theatre in Pilsen was short-lived, no more than 18 performances. From September 9 to 18, Lyric Stage in Irving, Texas produced the musical. The production featured a 39 piece orchestra and full original orchestrations that had not been heard since 1961 when the original production closed. It also featured an acoustic guitar part, which had been removed prior to the Boston tryout due to pit size. The production, directed by Len Pluger and Music Directed by Jay Dias, starred Sue Mathys as Rose, Ashton Smalling as Dainty June (she has previously been Baby June at Ravinia in 2006) and Caitlin Carter as Tessie Tura, with local performers Mary McElree as Louise and Sonny Franks as Herbie. Tovah Feldshuh starred as Rose at the Bristol (PA) Riverside Theatre (BRT) production of Gypsy which opened on December 8, 2011 following two nights of previews. The production, directed by BRT artistic director Keith Baker, ran until January 15, 2012. Gypsy opened in Leicester, UK for a 6-week run in March 2012. Directed by Paul Kerryson and starring Australian musical theatre actor Caroline O'Connor as Rose. Among the cast were Victoria Hamilton-Barritt as Louise, David Fleeshman as Herbie, and Daisy Maywood as Dainty June. In March 2013, Gypsy premiered at LASALLE College of the Arts in Singapore. The production was directed by Tony Knight, musical direction by Ben Kiley, and co-directed and choreographed by Broadway's Nikki Snelson. The show was performed at The Singapore Airlines Theatre with Vanessa Powell as Rose, Emma Etherington as Louise, Timothy Langan as Herbie, Kelly White as June, and Erin Clare and Alison Eaton as Tessie Tura and Miss Mazeppa. In July 2014, Leslie Uggams starred as Rose, directed by Vincent Cardinal (CRT, Artistic Director), with musical direction by David Williams. The production also featured Michael James Leslie as Pop, Scott Ripley as Herbie, Alanna Saunders as June, and Amandina Altomare as Louise. Uggams' appearance marks the first African-American woman to portray Rose in an Equity Production. In October 2014, Imelda Staunton starred as Rose in a production directed by Jonathan Kent. Lara Pulver performed as Louise, Kevin Whately as Herbie, Louise Gold as Mazeppa, Anita Louise Combe as Tessie Tura and Julie Legrand as Electra. The musical ran to 8 November. In July and August of 2017, The Cape Playhouse presented a celebrated revival of Gypsy that featured Julia Murney as Rose. The production, directed by Michael Rader, choreographed by Jason Sparks and with music direction by Garrett Taylor, broke box office records and featured Caroline Bowman as Louise, James Lloyd Reynolds as Herbie, Tess Soltau as June, Garett Hawe as Tulsa, Jennifer Cody as Tessie and Ms. Cratchit and Wally Dunn as Pop/Goldstone/Webber. Rosalind Russell, Karl Malden, and Natalie Wood starred in the 1962 Warner Bros. film adaptation of the musical. Russell won the Golden Globe Award for Best Actress – Motion Picture Musical or Comedy for her portrayal of Rose. Gypsy was also adapted as 1993 television movie with Bette Midler playing Rose. Cynthia Gibb portrayed Louise and Jennifer Beck portrayed Dainty June. Bette Midler won the Golden Globe Award for Best Performance by an Actress in a Mini-Series or Motion Picture Made for TV; Michael Rafter won the Emmy Award for Outstanding Individual Achievement in Music Direction. This production was a rare example of a film or TV project in which some of the songs are sung live, and not lip synced to a prerecorded track. The 2015 London revival of Gypsy starring Imelda Staunton was recorded live at the Savoy Theatre during its run and broadcast on BBC Four on 27 December 2015. This recording was released on DVD in November 2016. In January 2011, the New York Post reported that Barbra Streisand was in negotiations to produce, direct and star in a new film version of Gypsy. In an interview with the New York Post, Arthur Laurents said, "We've talked about it a lot, and she knows what she's doing. She has my approval." He said that he would not write the screenplay. In a clarifying statement and report, The New York Times wrote that Streisand would star, but would not produce or direct. Streisand's spokesperson confirmed that "there have been conversations". However, Frank Rizzo of courant.com reported on March 12, 2011, that the film with Streisand "is not going to happen, according to playwright-director Arthur Laurents, one of the rights holders to the work." But that was contradicted by an August 2011 report by USA TODAY that the plans for a film adaptation of Gypsy were still intact. "Before writer and director Arthur Laurents died at age 93 last May, there had been much talk about a movie version of Gypsy starring Streisand as Rose. 'We just have to find our team and a writer,' said Streisand. 'It's too bad, because I was looking forward to working with Arthur,' who directed Streisand in her Broadway debut. 'I had seen him a few months before that, and he seemed so strong and healthy.'" In March 2012, reports stated that Universal Pictures was pressing on with the new film. Streisand was still attached to produce and play Rose, with Joel Silver co-producing and Julian Fellowes scripting. Playbill reported in October 2015 that "Universal, which had been working with Streisand on the project, formally put Gypsy in turnaround, meaning it has decided not to develop the film any further. Streisand reportedly has been working with producer Joel Silver on the project, and they are now free to shop their Gypsy around to other studios." In April 2016, it was reported that Streisand was in advanced negotiations to star in and produce the film, which will be directed by Barry Levinson and distributed by STX Entertainment. In July 2016, it was reported that Richard LaGravenese had finished writing the script for the film and that production for the film was aiming to begin in early 2017. However, on August 3, 2016, it was reported that STX Entertainment "was withdrawing as distributor and co-financier of the film." In February 2019, it was reported that Amy Sherman-Palladino will write and direct the remake, Silver is still producing, and distributed by New Regency. There are recordings of each of the Broadway and London productions, as well as the film and television productions. The original 1959 and revival 2003 cast albums each won the Grammy Award, Best Original Cast Show Album. The original Broadway cast album was Ethel Merman's first recording in the then-new stereophonic sound technology. Motion pictures recorded in stereo had been steadily made since 1953, and stereo was first used on magnetic tape in 1954, but it was not until 1958, a year before Gypsy opened, that it became possible to use this technology on records. The 1974 Broadway recording was not an actual recording of the Broadway revival, but a remix of the London Cast recording of 1973 with a new recording of "Some People". The 1989 Broadway cast recording was released in 1990. The 2008 Broadway cast recording was released August 28, 2008. The 2015 West End cast recording was recorded at Angel Recording Studios in London on 9 March 2015 and was released on 27 April 2015. The 2001 Royal Variety Performance featured Cilla Black, Paul O'Grady (in his Lily Savage persona), and Barbara Windsor singing "You Gotta Get a Gimmick". ^ a b Brantley, Ben. "New Momma Takes Charge". The New York Times. May 2, 2003. ^ a b c Rich, Frank (November 17, 1989 The Hot Seat: Theater Criticism for The New York Times, 1980–1993. Random House. 1998. ISBN 0-679-45300-8. ^ "Gypsy at sondheimguide.com". Retrieved 22 August 2014. ^ "Gypsy at IBDB". Retrieved 22 August 2014. ^ "Gypsy: A musical fable, St. James Theatre (3/27/2008 – 1/11/2009)". Retrieved 22 August 2014. ^ "Gypsy (Original Cast Recording) – Tyne Daly". iTunes. Retrieved 22 August 2014. ^ Lunden, Jeff. "Stage Mother from Hell: Needy, Greedy Mama Rose". NPR.org. April 13, 2008. ^ Kantor, Michael and Laurence Maslon, Broadway: The American Musical, Bulfinch Press, New York, p. 286. ^ McKinley, Jesse. "On Stage and Off". The New York Times. February 8, 2002. ^ Kissel, Howard. "No 'Gypsy' In Her Soul". New York Daily News. May 2, 2003. ^ Brantley, Ben. "New Momma Takes Charge". The New York Times. May 2, 2003. ^ Gans, Andrew. "Momma's Goin' Strong: Gypsy Breaks All-Time Shubert Box-Office Record" Archived 2012-10-21 at the Wayback Machine. Playbill.com. June 23, 2003. ^ McKinley, Jesse. "'Gypsy' to Close Feb. 28, At a Loss of Millions". The New York Times. February 3, 2004. ^ a b "Final Curtain to Fall on 'Gypsy' May 30". The New York Times. April 22, 2004. ^ Gans, Andrew. Patti's Turn: LuPone Is Mama Rose in Ravinia's Gypsy Beginning Aug. 11" Archived 2012-10-19 at the Wayback Machine. Playbill.com. August 11, 2006. ^ Brantley, Ben. "Curtain Up! It’s Patti’s Turn". New York Times. March 28, 2008. ^ Gans, Andrew. "LuPone Gypsy Will Now Close in January 2009" Archived 2010-12-10 at the Wayback Machine. Playbill.com. December 14, 2008. ^ Stage Tube (22 March 2012). "STAGE TUBE: Brian Williams Takes on Audience Cell Phone Usage – Patti LuPone & More". BroadwayWorld.com. ^ "Cell Free? Coping with violators of the no cell phone rule". NBCNews.com. ^ Green, Jesse. "Let Her Entertain You. Please!". The New York Times. July 8, 2007. ^ correspondent, Tim Masters Entertainment. "Olivier Awards: Record eighth win for Judi Dench". BBC News. Retrieved 2016-04-03. ^ Hetrick, Adam. "'Gypsy', With Tovah Feldshuh, Opens at Bristol Riverside Theatre Dec. 8" Archived 2012-01-08 at the Wayback Machine playbill.com, December 8, 2011. ^ "Julia Murney and Caroline Bowman Star in Cape Playhouse Gypsy, Beginning August 8 | Playbill". Playbill. Retrieved 2018-05-28. ^ Hodges, Ann. "Cast shines in latest version of musical hit 'Gypsy'". The Houston Chronicle. December 12, 1993. Section: Television, p. 3. "It's surely the first time in a long time that the actors singing the songs are actually singing them, instead of just moving their lips to a pre-recording." ^ "Gypsy: The Musical [DVD]". Amazon.co.uk. Retrieved December 21, 2016. ^ Riedel, Michael. "Babs Comes up Rose". New York Post. January 5, 2011 (updated from January 4, 2011). ^ Gans, Andrew. "Will Barbra Streisand Star and Direct New Film Version of Gypsy?" Playbill.com. January 5, 2011 (updated). ^ "Streisand/'Gypsy' Film Project a No-Go, Says Arthur Laurents" Archived 2011-03-16 at Archive.today. Hartford Courant (courant.com). March 12, 2011. ^ "'Marvelous Mrs. Maisel's Amy Sherman-Palladino Revives 'Gypsy' At New Regency". Deadline. February 6, 2019. Retrieved February 15, 2019. ^ "The Sam Mendes Handbook – Everything you need to know about Sam Mendes". google.com. ^ "Gypsy [1989 Broadway Revival Cast] – Tyne Daly, Original 1990 Cast | Credits | AllMusic". AllMusic. Retrieved 2016-11-16. Wikimedia Commons has media related to Gypsy (musical). "Christmas Shtick: Gypsy’s Long-Gone Stripper Tree Is Fondly Remembered"